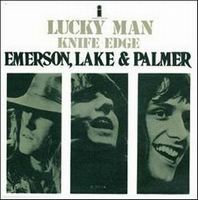 The first single Emerson, Lake & Palmer released from the eponymous debut was Lucky Man/Knife Edge. Lucky Man, which became a fan favorite at concerts and got much radio play on AOR radio stations, was actually recorded just to fill leftover space at the end of the album at the request of the record company. It was originally written by Greg Lake for acoustic guitar when he was 12 years old and wasn't well received by either Emerson or Palmer. At Lake's request, Emerson provided a Moog solo at the end of the track, a solo that became a part of Emerson's trademark sound and often referred by many as one of the most popular keyboard solos of rock history (though technically Emerson produced much more amazing keyboard solos on other songs that didn't get the radio play Lucky Man got). The B-side is the frantic Knife Edge, which was based on the first movement of Janáček's Sinfonietta with a middle section from Bach's first French Suite in D minor. Emerson provides some skilled organ work and Palmer's drumming is spectacular. Of all of ELP's singles, this was probably the best one ever released. In fact, it is one of very few to make Billboard's Hot 100, peaking at number 48. But seeing that this is a 45-rpm vinyl number and both songs are off their debut album, I just can't see anyone looking for this except for collectors of such stuff and especially ELP collectors. Musically ELP made much better material on their albums, but this one is at least a three-star affair.